‘ We value time and safety more than the freight charges’ . A customer satisfaction based policy has driven us during all these years. 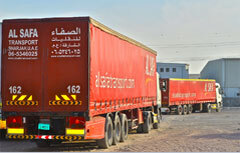 Al Safa Transport provides trucking services in the UAE and from the Emirates to GCC and Levant. We offer a wide variety of fleet which ensures a one window option for clients. We Everest Industrial Company LLC are working with Al Safa Transport for our transportation requirements.